Combine eggs and sugar in a heat-proof mixing bowl. Place the bowl over a large saucepan that has several inches of water simmering in it, and whisk the mixture until is begins to get warm, but not hot. Remove from heat and whisk for five minutes at high speed. Then whisk another 10 minutes at medium speed until mixture is shiny and thick. Fold in flour and vanilla, and add melted butter in a slow stream, mixing the entire time. Pour batter into pan and bake for twenty-five minutes. When cake is done, remove from oven and turn out of pan on to a wire rack to cool. Using a long knife, gently slice the cake in half, and set aside top layer. When the cake is completely cool, gently cover the top of the bottom layer with the strawberry jam, then top with pastry cream. Replace top layer of cake. 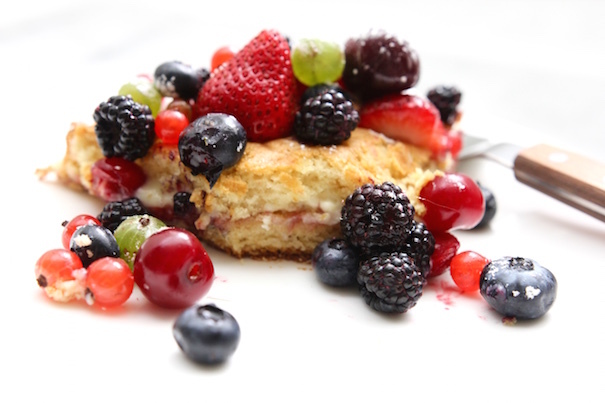 Mound mixed fruits on top of cake and sprinkle with powdered sugar. Serve immediately. Combine milk and half the sugar in a saucepan and bring to a boil over medium heat, being careful not to scorch the milk. Whisk together egg yolk and egg in a bowl. In another bowl, mix remaining sugar and cornstarch, and stir in egg mixture until well-blended and not lumpy. Pour a thin stream of milk into the eggs, mixing constantly. Then return mixture to the saucepan and slowly bring to boil, stirring constantly. As soon as the mixture boils, remove from heat, add the butter and vanilla and blend in. Using a sieve, strain custard to remove any lumps. Cover custard with a piece of plastic wrap to prevent a skin from forming and refrigerator until ready to use.